When I got up this morning and looked at the thermometer I new I couldn't let an opportunity of a warm, fall morning (60 deg F) go by without riding something. 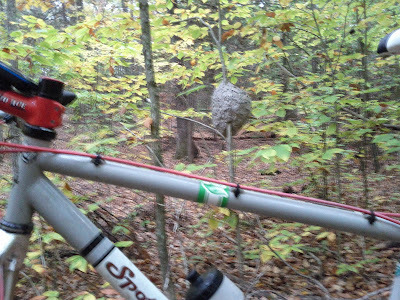 I hopped on the Spot, naked (no tools, tubes, or anything else that would get me out a jam and prevent a walk of shame) and rode off into the woods with my Garmin, a water bottle and a bell (hunting season). 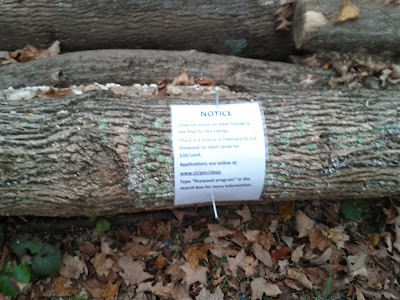 Basically, what that little sign says is it's a crime to steel the DEEP's wood. By the sawdust in the parking lot it appears someone helped themselves to some wood, that has been sitting here probably 6 months now and I have been wondering when's going to be hauled away. These logs would make some awfully nice skinnies! The Gussy is really, really dry but what's neat is how the trail is differentiated from the rest of the surrounding area by the fact that the leaves in the trail are a different color. It really makes the trail stand out. 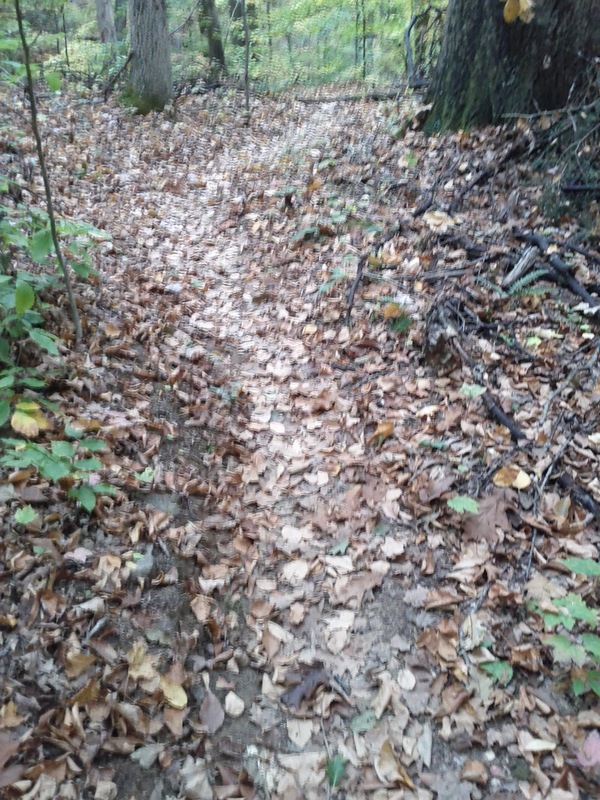 Contrary to popular opinion don't blow the leaves off a trail because they help stabilize the soil and provide protection against too much run off. I think the only thing that would be difficult about riding right now is if you were night riding. 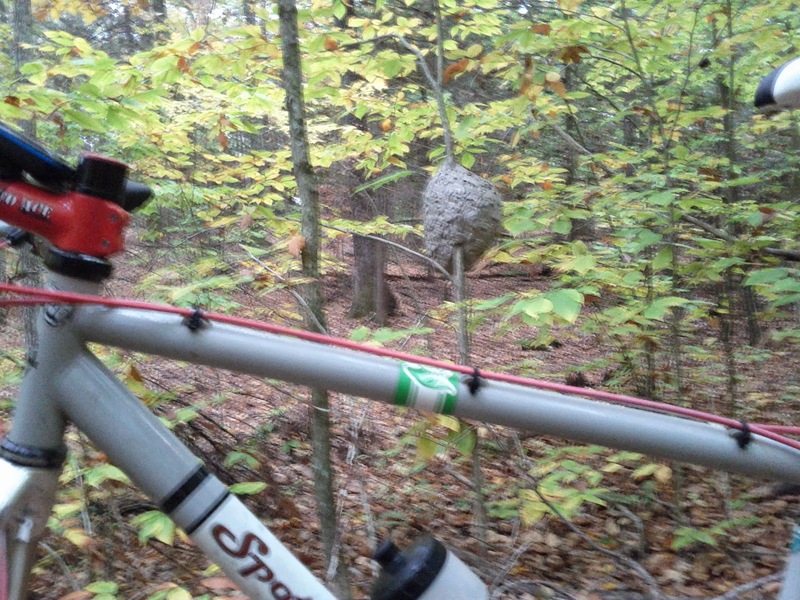 I saw this White Faced Hornets nest a couple of weeks ago and subsequently got an email from a concerned rider who also recently noticed it and called the DEEP, who said they would take care of it. There was no activity so I couldn't really tell if the State had done anything yet or was it too early in the morning for the little suckers. I didn't hang around to find out. Looks like the new route to the Three Bears is getting a lot of use. I think I need to take a closer look at it and see if it can be enhanced because I think there are some other rollers between Sandy's Reroute and the Three Bears that could be really run. 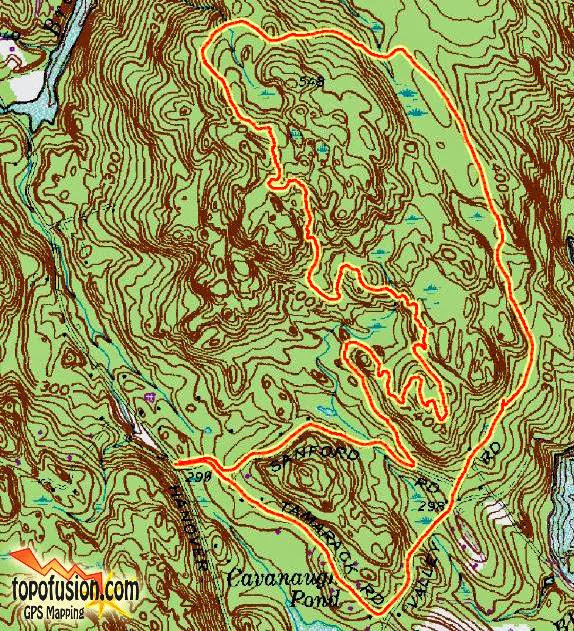 Otherwise, trail is in really good shape!